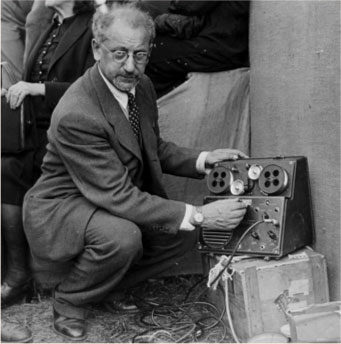 In 1946, Dr. David P. Boder, a psychology professor from Chicago's Illinois Institute of Technology, travelled to Europe to record the stories of Holocaust survivors in their own words. Over a period of three months, he visited refugee camps in France, Switzerland, Italy, and Germany, carrying a wire recorder and 200 spools of steel wire, upon which he was able to record over 90 hours of first-hand testimony. These recordings represent the earliest known oral histories of the Holocaust, which are available through this online archive. The Holocaust Education Video Toolbox is designed to help educators teach the Holocaust. The focus is on methodological and pedagogical suggestions that aid with this often daunting task, as well as practical materials and discussion points for classrooms and groups - hence the name, Video Toolbox. In choosing the various topics, we have drawn on our experience with a global audience of teachers at the International School for Holocaust Studies at Yad Vashem. Fundamentals: These videos lay out some of the foundations of Holocaust education as we see them at the International School for Holocaust Studies at Yad Vashem. Witness Testimony: These videos detail the various uses for testimony and testimony films in the classroom. Online Resources: These videos focus on items on Yad Vashem's website, demonstrating their various educational uses. Published Materials: These videos profile some of our published educational materials, demonstrating how these might be used in the classroom. Echoes and Reflections: These videos introduce lessons from the Echoes and Reflections educational program. This movie, which focuses on the story of the Lodz ghetto, will discuss the challenges of teaching about this period: how can we make the story of the ghettos relevant to our students? The poem "Testimony" by Dan Pagis confronts complex ethical, philosophical and theological issues that arise from the Holocaust. More than 150,000 Jews passed through the Terezin ghetto during the Holocaust, among them many prominent in the fields of culture. In this video we present the artists of the ghetto, focusing on the "Vedem", edited by Petr Ginz. In order to learn about the Holocaust it is important to understand what was lost. The interwar Jewish world in Europe was a thriving, diverse community. We present a glympse of this rich tapestry, through family films, diaries, letters, and notebooks from the prewar period. More than 150,000 Jews passed through the Terezin ghetto during the Holocaust, among them many prominent in the fields of culture. In this video we present the artists of the ghetto, focusing on the artwork "SS Dog" by Leo Hass. Incoporating examples from the world of sports into Holocaust education makes the point that the Holocaust happened in the modern world – a world where there were sports teams, stars and cheering crowds. It is also current and familiar to many students' lives. This is one way we can bridge the gulf between the Holocaust as a massive historical event and the Holocaust as a human story. What is antisemitism and what role did it play in Nazi Germany? How can we teach and explain to students the concept of antisemitism? The “Auschwitz Album” is the only surviving visual footage of the process of murder at the Auschwitz-Birkenau camp. We present several points to keep in mind when teaching using this resource. For must Holocaust survivors, the period immediately following liberation were bittersweet. The war had ended, but in almost all cases survivors were left without most or all of their families, without a home to speak of, and with a difficult, uncertain future ahead. For survivors after the war, life in the Displaced Persons (DP) camps represented their first steps forward after unimaginable suffering. We consider the pedagogical lessons to be learned from this chapter in the immediate postwar period. Art is an excellent tool in teaching the Holocaust. One need not be an expert to broach the field, and there is a wealth of Holocaust-related art to choose from in approaching the Holocaust from a more in-depth, emotional perspective. Some six million Jews were murdered in the systematic mass murder of the Jews of Europe that was defined by the Germans as the "Final Solution" of what they termed the "Jewish Question." This video addresses the complexities of teaching about the Final Solution. Photography is a major primary resource in teaching the Holocaust in our classroom. In this video, we look at some of the considerations to keep in mind when choosing and examining photographs from the Holocaust period. What is the Holocaust? Who were its victims? When did it occur? What were the ghettos, and why were they established? When did the “Final Solution” begin? How did it unfold, and was it planned from the outset? Dr. David Silberklang here outlines the major stages in the development of the “Final Solution”, the murder of some six million Jews in Europe. How can a vast subject like the Holocaust be taught effectively? How can we approach this often difficult, often daunting subject? How do we teach the Holocaust using interdisciplinary methods? How can poetry, art, film, and literature contribute to the study of this complex subject? The perpetrators of the Holocaust are often seen purely as monsters, diminishing the lessons to be learned from this topic. In this video we deepen the debate over difficult questions of personal choices and morality in the face of evil, by taking a case study of one perpetrator. Face-to-face survivor testimony has brought a unique, now sadly diminishing dimension into Holocaust study in the classroom. In selecting video testimony, some important principles should be taken into consideration. The Warsaw ghetto was the largest ghetto under Nazi rule, housing at its peak as many as 450,000 Jews. Survivor testimony, in presenting the story of the individual, stands at the core of Holocaust education. The Escape From the Ghetto Dvora Trebnik Translated by Eilat Gordin Levitan and Ona Kondrotas Dora Trebnik was born in 1920 to the Eyges family of Globoki. She is the sister of Miriam Tokorski. In 1960, she immigrated to Israel. At the time of publication, she lives in Holon. She was interviewed for this story by David Cohen.